The throttle body C-clip secures the diverter valve charge pipe to the throttle body assembly on the N54 and N55 engines. Unfortunately, this particular part was not available for replacement from the dealership. To purchase a replacement in the past, you would have to purchase a new factory diverter valve charge pipe just to get this part. 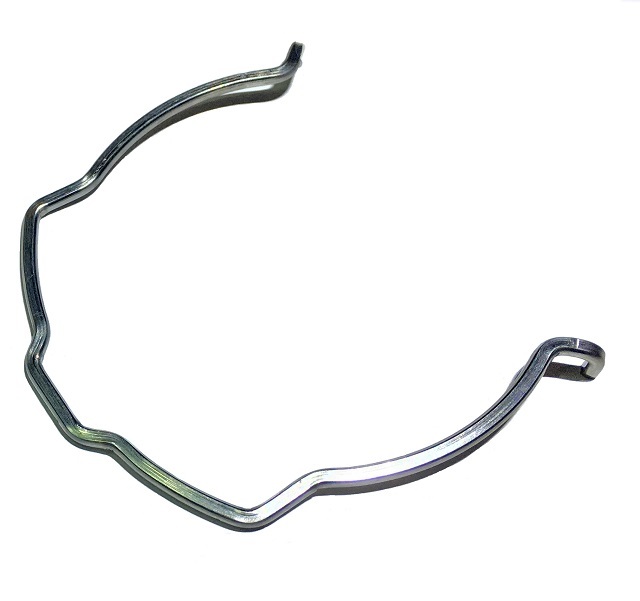 After much demand from customers, we have finally released a replacement throttle body C-Clip for the N54 and N55 engines. The replacement throttle body flange is made out heat treat high tensile stainless steel. Developed specifically for BMWâ€™s all-new N54 twin turbo motor, as found in the BMW 135,335 and 535 models, Forge Motorsport adds another replacement valve application to our already extensive vehicle specific and universal valve lineup. While virtually identical in operation to the Bosch style valves as used from the factory on many other turbocharged applications, primarily Volkswagen and Audi, BMW has utilized a very different type of valve connection mechanism that makes their product and our replacement components very unique. Starting with the worldâ€™s best selling direct replacement Bosch style valve, our own 007P piston-based design, we have revised virtually every single component of the valve body, (except the internal piston), in order to retain BMWâ€™s unique connection mechanism yet offer improved functionality in every other possible way. The entire valve assembly is precision CNC machined from T6-6061 billet aluminum alloy on our very own Mazak CNC milling machines. Again, the valve is an aluminum piston based design, offering significantly improved reliability over the failure prone OEM diaphragm valves, yet with no change to valve response time. We utilize ultra high temperature Viton brand silicone o-rings for sealing and Mobil1 fully synthetic bearing grease for lubrication. The valves are fully tunable for both boost holding capacity and response by way of proprietary interchangeable springs and shims (washers to marginally adjust preload). By utilizing this method of valve tuning with multiple custom spring rates, the valves will retain the maximum range of piston travel and flow volume regardless of which spring rate is used. Valves with a singular spring requiring that adjustments be made by continually adding preload will suffer from decreased piston or diaphragm travel as the spring tension is increased. Though these types of valves may hold high boost levels under load, they will actually suffer from limited flow volume at throttle lift when the valve vents. The hoses included in the kit are a custom made multi-layer fabric reinforced flexible silicone hose that are designed to allow compatibility with the stock airbox and charge piping setup without any permanent modification being required to adapt our replacement valves. Even the included hose clamps are overkill. They are specifically designed for use with silicone hoses, utilizing a beveled band edge and a pressed in drive mechanism rather than perforated. They are even approved by NATO for international military use. All told, this direct replacement valve kit will be suitable for a bone stock car to one that is heavily modified. They can be installed on the car right on the showroom floor and they will last well past having upgraded your intake, exhaust, and ECU software. They are capable of handling an infinitely wider range of boost pressure, more reliably, than the OEM valves, and they carry an unlimited lifetime warranty and money back guarantee. After 3 years of development, they're finally ready. Introducing our Competition Series Twin Oil Cooler System that SOLVED the dreaded limp mode! COMPLETELY SOLVES THE DREADED LIMP MODE ISSUE found on the N54/N55 engines due to oil temperature! TWO large 9"x8"x2" (11"x8"x2" with end tanks) Oil Coolers. Factory stock single oil cooler 8.75"x4.75"x1"
Over 700% larger (combined twin coolers) than the factory oil coolers!!! Twin coolers have a total of 288 cubic inches of core! Factory oil cooler has 41 cubic inches. Available with no finish (silver) or Type III Hard Black Anodizing (for stealth). Hard anodizing helps improve durability of intercooler fins against damage from road debris (rocks). Enclosed box with venting louvers - protects oil coolers from road debris without sacrificing airflow! High Quality Goodrich AN Fittings in Black Anodize - NO China made fittings used here. Optional Carbon Fiber or Aluminum Shrouding to direct airflow through the oil coolers for improved efficiency. Includes all hardware needed to install. No need to go hunting for hardware to finish the installation. Developed under the harsh racing conditions on our 135i Race Car. The 135i/335i comes from the factory with a small oil cooler with a core size of 8.75"x4.75"x1" (222mmx121mmx26mm) which comes out to 41 cubic inches of core. The Competition Series Twin Oil Cooler system features two HUGE identical oil coolers 11"x8"x2" (280mmx203mmx51mm) with a core size of 9"x8"x2" (229mmx203mmx51mm) each. Each oil cooler comes out to 144 cubic inches which is 3.5 times larger than the factory unit each! Since there are two oil coolers, you have a combined 288 cubic inches of oil cooler core, over 700% more core than the factory oil cooler. Through 3 years of development and testing, our Competition Series Oil Cooler has kept our Time Attack 135i from seeing the dreaded limp mode issue due to oil temperatures. Regardless of conditions (ambient temperatures and track lay out), we have never exceeded 259F!!! This is in 110F+ track temperatures and wide open throttle pulls all the way to 6 gear (160+ mph). Through test cars used in our beta testing program, we are getting independently gathered, unbiased data showing the same exact thing. Each Competition Series Twin Oil Cooler mounts to its own box enclosure. Louvers on the backside of the box enclosure ensures airflow through the oil coolers while protecting the oil cooler from road debris, especially debris kicked up from the front tires. During initial testing, our box enclosure had a big window (open hole) in the back for airflow. However, throughout the race season, it took so much abuse from rocks, tire and other debris kicked up from the front tires that we had to replace the oil coolers on our Time Attack 135i. Thus, instead of a big hole for airflow to flow through, we used louvers instead to protect the back side of the oil coolers. This effectively solved the issue without any affect on performance. Oil temperatures as well as oil temperature deltas stayed the same. Everything needed to install is included with the kits. No low quality, cheap fittings and lines made overseas used here. High quality Goodrich anodized black AN fittings and high end Goodrich Nylon Braided Lines are used throughout the kit. Traditionally, oil lines would typically be routed so that the oil gets split to each of the oil coolers (each oil cooler handling 50% of the oil) due to ease of building the system and lower costs. Our Competition Series Twin Oil Cooler System however are setup in a "sequential" configuration. What this means is that oil travels from one cooler to the other thereby 100% of the oil goes through both oil coolers. Our testing have shown significant increases in efficiency and performance running a "sequential" configuration. Our new CNC machined oil filter housing adapter (included in the kit) makes this possible. Those of you who track your cars know what we're talking about. Many nightmares and sleepless nights. Plenty of days, waking up before the sun comes out, loading up your gear and heading to the racetrack (sometimes hours away) to go race only to be ruined by the dreaded limp mode on the very first hot lap. Hundred of dollars wasted on a track day you can't enjoy because your car can't make a single lap under full power. The disappointment. We felt it. We know how you feel. This was our life the very first year (2008) we started racing our 135i. Every single race, we fought it. The dreaded limp mode. Our driver would shift at 4,500 rpm and every other lap would be a cool down lap. Life was miserable. For those who don't know, limp mode is when your ECU detects something is wrong and cuts almost all power to the car in hopes of saving itself. What was causing it? Oil temperatures. We were easily seeing over 260F even on a cold day. By 265-270, limp mode would hit and that was the end of it. We did additional testing on a dyno by doing constant runs and datalogging what was going on which confirmed that oil temperatures were the culprit. Interesting thing was that when the car hit limp mode, power would drop to only 50whp every single time. Once, we figured out it was oil temperatures causing the limp mode, we went straight to work trying to solve the issue. We started off first by adding a small auxilary oil cooler in conjunction with the factory oil cooler. This was a laughable attempt. This did absolutely nothing noticeable. The next race, limp mode just like before. Our next attempt, we thought maybe the factory oil cooler just wasn't really efficient. Thus, we changed that out to a new, larger unit. With the new oil cooler with the small auxilary oil cooler, we finally saw a slight drop in oil temperatures. However, it wasn't much and again, at the next race, limp mode. Our next attempt saw us building ducting shrouds to channel cold air to the oil coolers. Again, this saw another drop in oil temperatures and better ability to fight off "heatsoak" but still, not enough. The car would still limp at the track. Fustration was setting in for us. Many long days going to the track being ruined by limp mode. This was our 2008 race season. With the 2009 race season looming, we decided to go all out. We were tired of limp mode. Tired of trying to get the car to do 1 lap under full power. Tired of finishing in the middle of the pack. This was when the twin oil coolers was born. We scrapped the small auxilary oil cooler and added an identical oil cooler on the driver's side. Thus, we had 2 large oil coolers, one on each corner. The first race, everyone though we were crazy running 2 large oil coolers., yet SUCCESS! Oil temperatures had dropped significantly. We were now able to do more than 1 lap under full power. Yet, this was not the end of the limp mode journey. We're located in Southern California and thus, we frequently see ambient temperatures over 100F. Our race tracks are also all located in the high desert region. Perfect for some extreme testing. Even though the limp mode issue was now under control with the twin oil coolers, on very hot days, it would rear its ugly head. Also, on certain high speed tracks where we would be at WOT for long periods of time, like Autoclub Speedway's oval configuration (think Nascar), we would occassionally hit limp mode. Thus, we spent the entire 2009 season refining the twin oil cooler system. Originally, we had routed the oil lines so that the oil split at the oil filter housing. This originally started because of our earlier attempts to keep the factory oil cooler. Yet it dawned on us that this was not efficient. In essense, since the oil was being split in half, each going to one of the oil coolers, we weren't cooling all the oil with both coolers. Granted, it still worked since each cooler is now only charged to cool down half the oil in the system but it was inefficient. Thus, we devised a new system to run the oil lines sequentially to take full advantage of both oil coolers. Oil now runs from the oil filter housing to the first oil cooler. Then it runs to the second oil cooler and back to the oil filter housing. Basically, now 100% of the oil was going through both oil coolers. With the new oil line system, we saw a big change come race day. The oil temperatures again dropped but what also changed was how much longer the oil cooler fought off "heatsoak". Temperatures were more stable and stayed lower longer throughout the whole race session. And the best thing of it all? We completely SOLVED the dreaded limp mode problem! By the end of the 2009 race season, limp mode was a thing of the past. Regardless of temperature or track, we NEVER again experienced the dreaded limp mode! 2010 race season was monumental for us. With all the refinements made in 2009 to the twin coolers and solving the limp mode issue, we were FINALLY able to really work on making our 135i fast. Instead of spending time and energy trying to fight off limp mode, we spent it making tweaks and upgrades to our 135i. The first race of 2010 saw us podium in 2nd place. That was the beginning. Every single race after that saw us take podium finishes. July 4th, 2010 saw our first victory with a first place finish in Street RWD as well as Street Overall Class and setting a new class track record at Willow Springs Raceway. Every since then, we have claim a 1st place Street Overall victory at every single event and even recently set another class track record. All this happened because of oil coolers... the Competition Series Twin Oil Coolers that solved the dreaded limp mode. The oil coolers come standard with no finish (silver color). Just like our intercoolers, we're now offering them with the Type III Hard Anodize Black for guys who want the stealthy look. With the Type III Hard Anodized finish, it is very hard to tell there is an aftermarket oil cooler on the car. Another added benefit of the Type III Hard Anodizing is that it makes the oil cooler fins harder and stronger, which makes it less prone to getting bent/damaged from road debris like rocks etc... We opted for the Type III Hard Anodizing over the Type II color anodizing which is only asthetics for this purpose only (even though it cost us considerably more to anodize Type III than Type II). We started using the Type III Hard Anodized Black finish on our rally car customer's FMICs years ago. Rally cars go through tremendous amounts of abuse and it was quite common to take hits on the intercooler from debris on the course. In fact after 1 event, we would often see a large portion of the intercooler fins bent (killing efficiency) and fixing them after each event was quite tedious. After the Type III Hard Anodizing, we notice a big difference as there was considerably less damage. Even after hits and even accidents, the FMIC could take more abuse than before. Testing has shown no noticeable ill-effect from the Type III Hard Anodizing on performance (regular spray paint etc... has shown ill-effects on performance). Eventually, we started utilizing the same Type III Hard Anodize Black on our street cars and FMIC applications. It's only natural we would offer the same finish for our oil coolers. When the oil cooler box enclosures are used in conjunction with our optional ducting shroud kits, the oil cooler box enclosure actually seals and forces all the airflow captured by the ducting shrouds through the oil cooler cores. Improves the oil cooler's effectiveness and efficiency. The ducting shroud kits are available in aluminum. These are model and bumper specific so make sure you order the correct shroud kit. The very first 335i built in early 2006 did not come from the factory with an oil cooler. With the N54 engine running very hot, BMW quickly realized that this was a big mistake. An oil cooler was quickly added the next year. For those who do not have the factory oil cooler, you will need to convert your car's oil filter housing to a later model year that has external ports for an oil cooler. We are now offering these brand new genuine BMW parts to make the conversion. Parts included: Oil Filter Housing, Oil Cooler Thermostat housing, gaskets and hardware. Genuine BMW Parts for late model oil filter housing conversion. LIMITED TIME ONLY! WHILE SUPPLIES LAST! Free Evolution Racewerks t-shirt, keychain lanyard and license plate frame with purchase! After 3 years of development, they're finally ready. Introducing our Sports Series Oil Cooler System! Large 9"x8"x2" (11"x8"x2" with end tanks) Oil Coolers. Factory stock oil cooler 8.75"x4.75"x1"
Over 350% larger capacity than the factory oil cooler!!! Sports Oil Cooler has a total of 144 cubic inches of core! Factory oil cooler has 41 cubic inches. High Quality Goodridge AN Fittings in Black Anodize - NO China made fittings used here. It's well known that the N54 and N55 engines runs very hot. Turbos that build a lot of heat and a small radiator play into why this engine runs so hot. A quick look at your gauge cluster on your dash after a few minutes of "spirited" driving, you'll notice oil temperatures over 250 degrees. Considering that most cars don't even exceed 230 degrees tells you quite a bit. As oil temperatures get too high, thermal degradation occurs. This is when the oil starts to lose viscosity due to heat and start to break down and becomes more susceptible to "shearing" or oil breakdown. An internal combustion engine like the N54/N55 engine, imparts high shear forces on the motor oil, which is sandwiched between two rotating or sliding forces under load and heat. "Shearing" is when the molecular structure is essentially torn apart by these mechanical shear forces. Lower your operating oil temperature will greatly reduce this. Thus your motor oil is in better shape to protect the bearings in your car's engine, thus improving longevity. The 135i/335i comes from the factory with a small oil cooler with a core size of 8.75"x4.75"x1" (222mmx121mmx26mm) which comes out to 41 cubic inches of core. The Sports Series Oil Cooler system features a large 11"x8"x2" (280mmx203mmx51mm) oil cooler with a core size of 9"x8"x2" (229mmx203mmx51mm). The Sports Series Oil Cooler comes out to 144 cubic inches of core which is 3.5 times larger than the factory unit each! The Sports Series Oil Cooler mounts to its own box enclosure. Louvers on the backside of the box enclosure ensures airflow through the oil cooler while protecting the oil cooler from road debris, especially debris kicked up from the front tires. During initial testing, our box enclosure had a big window (open hole) in the back for airflow. However, throughout the race season, it took so much abuse from rocks, tire and other debris kicked up from the front tires that we had to replace the oil coolers on our Time Attack 135i. Thus, instead of a big hole for airflow to flow through, we used louvers instead to protect the back side of the oil cooler. This effectively solved the issue without any affect on performance. Oil temperatures as well as oil temperature deltas stayed the same. Everything needed to install is included with the kits. No low quality, cheap fittings and lines made overseas used here. High quality Goodridge anodized black AN fittings and high end Goodridge Nylon Braided Lines are used throughout the kit. We use high quality Goodridge stainless steel braided lines standard as they offer the best abrasion resistance. Upon request, we can supply Goodridge Nylon Braided oil lines. These high end Goodridge Nylon Braided lines are the new thing to use for oil lines as they have many advantages and no disadvantages (other than higher price) than traditional stainless steel braided lines. The main advantage is that they are lightweight. Nylon is considerably lighter than stainless steel. Nylon Braided Lines do not fray. Stainless steel braided lines will start to fray and those who are familiar with stainless steel braided lines know what we're talking about. The stainless steel mesh in the lines start to "fray" or break and thus you get poked with the broken ends. Saves a lot of bloody fingers. Nylon Braided lines can withstand more heat and retain the heat inside the line better. Stainless steel lines tends to release the heat inside the lines, thus when you touch the lines, they tend to be hot. When the oil cooler box enclosures are used in conjunction with our optional ducting shroud kits, the oil cooler box enclosure actually seals and forces all the airflow captured by the ducting shrouds through the oil cooler cores. Improves the oil cooler's effectiveness and efficiency. The ducting shroud kits are available in aluminum or carbon fiber. These are model and bumper specific so make sure you order the correct shroud kit. The Sports Series Oil Cooler Kit is upgradable to the Competition Series Twin Oil Cooler Kit. Just specify when ordering. The Competition Series Twin Oil Cooler Kit is ideal for those who track their cars. When the need finally comes for the Competition Series Oil Cooler Kit, you don't need to sell your Sports Oil Cooler Kit. Just purchase the upgrade kit! Now available for the 2009+ N54 Engines! Compatible with factory diverter valves or aftermarket factory style diverter valves. Lightweight High Grade 6061 Aluminum Piping. Throttle body matched 3" piping. Retains factory style o-ring throttle body lock flange. Precision CNC machined throttle body flange ensures leak free connection to throttle body. Quick and easy connection and disconnection to throttle body. Ideal connection compared to the silicone hose and hose clamp connection found in all other aftermarket diverter valve upgrade pipes available in the marketplace. Precision CNC machined MAP sensor flange ensures leak free connection. Diverter Valve Charge Pipe features beaded ends and T-bolt clamps to prevent intercooler piping from coming off from boost. Factory diverter valve sound baffle, which causes turbulence in the factory pipe, is removed. Optional Type III Hard Black Anodizing (for stealth and OEM look). Hard anodizing helps improve durability of intercooler piping. Resists bent or dented piping. Developed under the harsh conditions of racing on our 135i Race Car. Optional TIAL Q Blow Off Valve available in 5 different colors (black, polished silver, red, blue and purple). Optional Synapse Synchronic Blow Off Valve now available!!! Optional HKS Super Sequential Blow Off Valve now available!!! Again, another parts development directly from our 135i Time Attack racing program. The factory diverter valves were causing an issue of not being able to hold up against the rigors of high boost application, therefore they needed to be replaced. Thus attention was brough to the factory diverter valve pipe and the need to optimize for maximum performance on a race car facilitated the need for a new pipe to be built. Often ignored, charged intake airflow characteristics greatly affect throttle response, turbo lag and ultimately maximum power potential. Smooth bends and minimal obstructions are ideal. This is not the case with the factory diverter valve charge pipe. On the factory diverter valve chargepipe features a sound baffle for the diverter valves. This sound baffle is connected on the side of the factory diverter valve charge pipe which splits airflow. This causes turbulence inside the pipe which slows the charge intake air velocity (speed of the air traveling inside the pipe). By removing this turbulence (by eliminating the factory diverter valve sound baffle), increased throttle response, decrease turbo lag and ultimately higher maximum power potential can be realized. Our Diverter Valve Charge Pipe eliminates this sound baffle and thus eliminating the unneccesary turbulence in the diverter valve pipe, keeping charge intake air velocity at it's maximum. Apparrently, BMW thought the same thing as later model (2009-10) did not come with this baffle. Factory Charge Pipe with DV Sound Baffle attached vs ER Charge Pipe. Note the better flow of the ER pipe. Since one of the reasons for changing out the factory diverter valves was to prevent boost leaks (from prematurely opening on high boost), causing boost leaks while upgrading the diverter valve would be counterproductive. During our research and development, the connection at the throttle body was looked over very carefully. The factory diverter valve is connected to the throttle body using an o-ring inside the throttle body flange which is locked in place by a c-clip, which works very well. It also make removal/installation quick and easy. Our testing had shown it could hold quite a bit of boost. During our testing, we had pressure tested this connection up to 25 PSI. The reason why we stopped at 25 PSI was because at 25 PSI, one of the intake pipes on the turbo blew off and we could not test any higher. Hoewver, we were confident that it would easily hold over 25 PSI as the throttle body flange showed no signs of failing. Also, keep in mind, this type of connection is used throughout the engine, in many crutial areas like the coolant radiator system as well as the clutch system. If BMW did not believe in the durability of this type of connection, they would not use it in such important areas. Many of our competitors use a silicone hose connection for the throttle body connection. It is not designed for a silicone hose connection which is used by all the other brand diverter valve pipe upgrades in the market. The throttle body lip is too short and there are no "beads" to prevent the silicone hose from blowing off under boost. Even though it is the easiest way to "rig" together, it is not ideal. The best way to connect the new diverter valve pipe to the throttle body is to replicate the same connection which we did. We spent a lot of resources developing and manufacturing this factory style connection for this reason. The same issue came with the MAP sensor. The MAP sensor seals to the factory diverter valve pipe via a o-ring on the sensor itself. Having a hole in a silicone hose will definitely cause a boost leak as it will not properly seal. Therefore, again we CNC machined our own replica MAP sensor flange that utilizes the same factory o-ring seal. MAP Sensor attached to the flange. The Diverter Valve Charge Pipe is available in the same 3 finish options as our intercoolers. It is available in brush (plain) or mirror polish finish standard. It is also available in our Type III Hard Black Anodizing for the stealthy, factory look. An added benefit of the Type III Hard Black Anodizing is that it hardens the aluminum piping and makes it more durable against damage (like dropping the pipe). With the popularity of methanol injection systems and nitrous systems, we have added the option of having a 1/8" NPT threaded bung (for methanol or nos injectors) welded to our diverter valve charge pipe. This allows quick and easy installation of methanol/nitrous injectors that are used in methanol injection systems and nitrous systems. You have the option of adding 1 or 2 injector bungs. Each 1/8" NPT bung will come with a plug so that you can run with or without the methanol injector. This is perfect for those who do not have the Methanol Injection yet but plan to do so in the future. 1/8" NPT Bungs (for methanol or nitrious injectors). Each bung comes with a plug (shown). From June 2009 and on, BMW changed the intercooler piping on the N54 engine. This revised intercooler piping essentially was exactly the same as the previous years except for one change. The "accordian" style rubber elbow between the lower intercooler piping and the diverter valve charge pipe was now integrated into the diverter valve charge pipe. In previous years, this "accordian" rubber elbow was a seperate part and could be removed. Since, it is now part of the new revised diverter valve charge pipe, it could not be removed. We now have a new diverter valve charge pipe designed specifically for the new N54 (June 2009+ build date). Since the June 2009+ models charge pipes include what is knows as "the meth elbows", they cost $50 more which is still cheaper than purchasing a "meth elbow" that other companies that sell them for $100. If you have a 2006 to 6/2009 and you want the "elbow" that replaces the "accordian" OEM elbow, you can purchase the 2010 model charge pipe. We are now stocking and selling the Forge Diverter Valve Upgrade Kit. They are available in machine allow (silver) or black. For more information on the Forge Diverter Valve Upgrade Kit click here. Choose this option if you are looking for an upgraded factory style valve. The standard option for our Diverter Valve Upgrade Pipe is designed for either the factory diverter valves or aftermarket "factory style" diverter valve. Also available is the TIAL Blow Off Valve option which utilizes the TIAL Q Blow Off Valve (BOV). The TIAL Q BOV features a large 50mm (2") valve to quickly discharged built up boost pressure. Since the TIAL Q BOV vents to the atmosphere which causes no restriction to venting boost, it reacts faster than recirculated diverter valves. The internal valve spring can be changed out to different spring rates which allow adjustability. This allows versatility as it allows you to increase the spring pressure in the future for when you run higher boost levels. Therefore, it eliminates the need to purchase another BOV or diverter valve if you increase boost levels. Essentially, this is the last blow off valve you will ever buy. The TIAL Q BOV is available in 5 different colors: black, polished silver, red, blue and purple. The black color option is standard. If you want any other color, please specify when ordering. The TIAL BOV is the quiestest BOV option. HKS Super Sequential Blow Off Valve (SSQV) 4 Blow Off Valve (BOV). You can order it with just the HKS BOV flange welded on or with the SSQV BOV included. We include only genuine HKS SSQV 4 (no oversea knock offs like you see on E-bay). The HKS BOV is designed to make a loud sound when releasing. Choose this option if you want all your neighbors to hear you coming down the street. HKS SQV Racing Blow Off Valve is a larger version of the HKS SSQV 4. It features a 51mm valve to release more pressure. You can order it with just the HKS Racing BOV flange welded on or with the SQV Racing BOV included. We include only genuine HKS SQV Racing (no oversea knock offs like you see on E-bay). We can also build our Diverter Valve Charge Pipe to utilize any BOV or diverter valve you desire. Love the way the Greddy BOV sounds? No problem, we can weld any BOV flange on our Diverter Valve Charge Pipe so that you can utilize any BOV or diverter valve you want. Due to the fact that there are so many options for BOV's and diverter valves, it will be impossible for us to stock these options. Therefore, it is available only as a special order and will be built to order. Contact any of our authorized dealers for more information on how to order this. Only the TIAL, Synapse and HKS BOVs are kept in stock. Add a replacement throttle body C-Clip. If your factory throttle body c-clip is lost or broken, you will need to order this. For more information about the Throttle Body C-Clip Replacement, click here. CAUTION: This product is intended for OFF ROAD USE ONLY. Not legal for use on pollution controlled vechiles upon public road/highways. THIS PRODUCT IS FOR SALE FOR ALL 49 STATES EXCLUDING CALIFORNIA. Free Evolution Racewerks keychain lanyard and license plate frame with purchase! Introducing our new, long awaited Competition Series Front Mount Intercooler (FMIC) System! Over a year of development and testing with our 135i Time Attack Race Car, our Competition FMIC is now ready. With the scorching heat found on Southern California racetracks, we pushed our 135i Time Attack Race Car to the limits in 100+ degree weather on numerous occassions. The results were 6 design revisions improving cooling efficiency and internal flow characteristics to introduce you to the ultimate intercooler solution for your 135i, 1M, and 335i! 335i Coupe with Competition FMIC, bumper off. Cast end tanks for improved durability and internal flow characteristics. Mirror polished finish on intercooler assembly and piping. Optional Type III Hard Black Anodizing (for stealth) finish on intercooler, end tanks and all piping. Hard anodizing helps improve durability of intercooler fins against damage from road debris (rocks). Complete all aluminum intercooler piping, replaces all OEM rubber hoses with hard piping for improved throttle response and faster boost spool up. Impoved intercooler inlet and outlet pipes for better flow characteristics. Intercooler piping features beaded ends, silicone "hump" hoses and T-bolt clamps to prevent intercooler piping from coming off from boost. Optional Carbon Fiber Shrouding to direct airflow through the intercooler for improved efficiency. Includes all hardware needed to install. Massive 6" Thick Competition FMIC Installed. The heart of the ER Competition FMIC is the massive 20"x5.5"x6" (26.5"x5.5"x3" with end tanks) high density bar and plate intercooler core. It features 660 cubic inches of very efficient high density bar & plate core (35% larger) versus the factory 425 cubic inches of less efficient tube & fin core. Through extensive testing of different types of intercooler cores (tube & fin, bar & plate) we found that the high density bar and plate core to be the most efficient. Independent testing (all data & dynos shown below have been independently conducted by our customers) has shown that our FMIC is so efficient in cooling that it has cooled intake air temperatures (IAT) to almost ambient (outside) temperatures. We also did extensive testing on the proper size to use to effectively cool the hot charged air as well as fight off heatsoaking (when the intercooler cannot transfer heat away faster than the heat building up from the hot intake air). Heatsoaking is not an issue at all as shown by consistency of the IAT staying in the same temperature range throughout the WHOLE RPM powerband. Also our FMIC recovers so fast after a full throttle pull that once you shift, it recovers completely. This is why pull after pull, our FMIC does not heatsoak. Beat on it all day long and the IATs will consistently be near ambient temperatures. Our Competition FMIC is just what it is, designed for competition. The other intercoolers may be adequate if you lived your life a ¼ mile at a time (with hours between runs to cool down), they will definitely heatsoak under harsher conditions like road racing where youre at full throttle for at least 20 minutes. With numerous laps around our local racetracks in 100+ degree weather, heatsoak is not a problem on our 135i Time Attack race car. With it's size and ability to support over 600hp, it is most likely the "last intercooler you will ever buy". One of the most overlooked aspect of intercooler design is the intercooler end tank and piping. Having shorter and less bends on the intercooler piping will promote better internal flow. This helps in reducing turbo lag, increase throttle response and faster boost spool ups. An intercooler end tank must be designed to channel and distribute air coming in from the inlet efficiently throughout the intercooler core. Our end tanks design has been revised numerous times to promote smooth internal air flow. The cast end tanks allow us to have nice smooth radius on the inner edges of the end tank, causing less turbulence. The inlet pipe angle has been changed to provide a smooth entry into the end tank and removes an extra bend that the factory hoses have. Rubber hosing expands under boost pressure. This expansion disrupts internal flow and causes turbulence, all of which slow down airflow velocity (which causes slower boost spool up and decreased throttle response). By replacing ALL the factory rubber hoses with hard piping, noticeable increases in boost spool up and faster throttle response can be seen. That is why our FMIC kit comes with a new upper intercooler piping whereas brand FMIC kits do not. Our Competition FMIC sits in the factory location underneath the radiator. Why you ask? The radiator fan and radiator shrouding extends from the radiator above, all the way down to the factory intercooler. By sitting our FMIC in the same location, we can take advantage of the radiator fan sitting behind the intercooler to pulling air through the intercooler core. This makes for even greater efficiency, just like how the BMW engineers designed it to do. With the optional Carbon Fiber FMIC Shrouding Kit, even greater efficiency can be had. The carbon fiber shrouding channels airflow from the center grill to the intercooler core. Air wants to travel through the path of least resistance, which in this case is around the intercooler core instead of through it. The carbon fiber shrouding prevents this and forces air to travel through the core. This is one of the many reasons why our FMIC performs as well as it does. Even with just a small fan on the dyno, intake air temperatures are still very low. Also, by maintaining the factory configuration, we do not block airflow to the radiator at all. The cooling system on the N54 & N55 engine is already at it's maximum capacity and we have seen overheating issues with both oil and coolant while racing. By having an intercooler blocking half the airflow the the radiator will definitely not help it's cooling efficiency. Evolution Racewerks Time Attack 135i. 439whp and 469lbs wtq. ER Comp FMIC, ER Downpipes, ER Exhaust, Injen Intake, GIAC stage 2 software on Sunoco 104 gas. Record Breaking 438whp and 450 lbs of torque. ER Comp FMIC, Catless Downpipe, Exhaust, Intake and JB3 on 100 Octane. 384 whp and 425lbs of Torque. ER Comp FMIC, Catless Downpipes, Exhaust, Intake and JB3 on 93 Pump Gas. 365whp and 411lbs of Torque with 91 Pump Gas. All our intercooler applications come standard with a mirror polish intercooler and piping. We also offer and stock our intercooler applications with Type III Hard Black Anodizing for the guys that want the stealthy look. With the Type III Hard Anodized FMIC, it is very hard to tell there is a FMIC on the car. Most of our customers with the Type III Hard Anodized FMIC comment that unless you know there is a FMIC on the car, nobody notices it. Another added benefit of the Type III Hard Anodizing is that it makes the intercooler fins harder and stronger, which makes it less prone to getting bent/damaged from road debris like rocks etc... We opted for the Type III Hard Anodizing over the Type II color anodizing which is only asthetics for this purpose only (even though it cost us considerably more to anodize Type III than Type II). We started using the Type III Hard Anodized Black finish on our rally car customer's FMIC's years ago. Rally cars go through tremendous amounts of abuse and it was quite common to take hits on the intercooler from debris on the course. In fact after 1 event, we would often see a large portion of the intercooler fins bent (killing efficiency) and fixing them was after each event was quite tedious. After the Type III Hard Anodizing, we notice a big difference as there was considerably less damage. Even after hits and even accidents, the FMIC could take more abuse than before. Testing has shown no noticeable ill-effect from the Type III Hard Anodizing on performance (regular spray paint etc... has shown ill-effects on performance). Eventually, we started utilizing the same Type III Hard Anodize Black on our street cars and now on our FMIC applications. We also offer our intercoolers in any color of the rainbow you want (special order) and is available in only Type II Anodizing (asthetics). Brush (or plain) finish is also available. Quality is very important to us. We do extensive R&D as well as beta testing to ensure this (as some of you may already know, waiting for us to release the production units). We only release our products once we feel we have reached perfection. We do not rush to get our products out even if there is alot of potential customers. Also, we do quality checks before the intercoolers are packaged. EVERY FMIC is pressure tested to 50 PSI of pressure before they are shipped to ensure no leakage. We include only high quality parts and accessories in our FMIC kit. Your FMIC Kit will come with expensive silicone "hump" hoses. Since the intercooler is mounted to the chassis of the car (that does not move) and the piping to the engine (which moves from when the engine rocks), these specialized silicone "hump" hoses allow the connection to flex therefore preventing hoses from ripping apart, increasing the durability and longevity of the intercooler kit. All intercooloer piping ends have a beaded edge. This beaded edge prevents the intercooler piping from slipping off the connection from boost pressure. We also include high quality t-bolt clamps. T-bolt clamps are specialized hose clamps to offer more clamping force than traditional worm clamps. The beaded piping ends and t-bolt clamps make it virtually impossible to having your intercooler piping blow off from boost pressure. We include detail instructions and ALL parts needed for installation. All our FMICâ€™s are backed with our Limited Lifetime Warranty. We go through extensive R&D to test all the innovations and features we incorporate into our intercooler systems. With years of experience building race cars and high power street cars, you can be sure that you're getting the best. Our Competition FMIC is offered in 3 different packages: Basic, Standard and Full Kits. 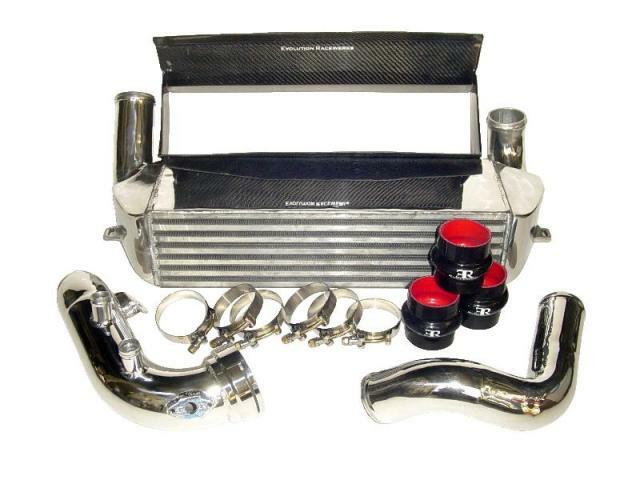 The Basic Kit consists of the intercooler assembly, upper intercooler piping, silicone hump hoses and t-bolt clamps. Everything you need to install the FMIC on your car and is what is typically included in most FMIC kits out in the market. The Standard Kit consists of everything included in the Basic Kit but adds the Diverter Valve Charge Pipe. The Diverter Valve Charge Pipe allows easy upgrades of the Diverter Valve or Blow Off Valves. Increase throttle response as well as decrease turbo lag are the benefits of the new Diverter Valve Charge Pipe. For more information about the Diverter Valve Charge Pipe, click here. The Full Kit consists of everything included in both the Basic and Standard Kits but adds the Carbon Fiber FMIC Shrouding Kit. The carbon fiber shrouding channels airflow from the center grill to the intercooler core. Air wants to travel through the path of least resistance, which in this case is around the intercooler core instead of through it. The carbon fiber shrouding prevents this and forces air to travel through the core. 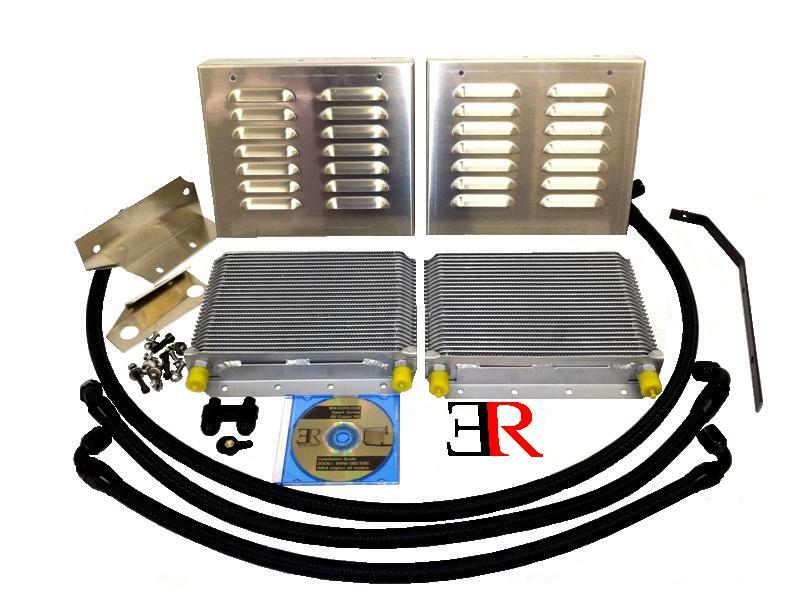 Below are optional equipment that can be added to any of the Competition FMIC package kits above. A Carbon Fiber FMIC Shrouding Kit can be added to the Basic Kit. Diverter Valve & Blow off Valve Option can be added to either Standard or Full Kits. BOV flange will be welded to the diverter valve pipe instead of the factory style diverter valve flanges. We are now carrying the Forge Diverter Valve Upgrade Kits. For more information about the Forge Diverter Valve Upgrade Kit, click here. You now have 3 different blow off valves to choose from: TIAL 50mm Q Blow Off Valve, Synapse Synchronic Blow Off Valve and HKS Super Sequential Blow Off Valve. TIAL BOV Option: Black color is standard. For other colors, please specify. Available in black, red, blue, polished silver and purple. With the popularity of methanol injection systems, we have added the option of having methanol injector bungs welded to our diverter valve charge pipe. This allows quick and easy installation of methanol injectors that are used in methanol injection systems. You have the option of adding 1 or 2 methanol injector bungs. For the 2010 (late 2009 build date), BMW changed the intercooler piping from previous model years. From 2006 to early 2009 build dates, the rubber "accordion" elbow after the lower intercooler pipe and before the factory diverter valve (charge) pipe was it's own seperate piece. From late 2009 build dates, it became integrated into the factory diverter valve (charge) pipe. Unlike other companies where their FMIC kits only come with the FMIC assembly, our Competition FMIC comes with intercooler piping. THEREFORE, PLEASE MAKE SURE YOU HAVE THE CORRECT BUILD DATE (check the sticker on the driver's side door jam) OR ELSE YOU MAY GET THE WRONG PIPING KIT. Free Evolution Racewerks keychain lanyard and license plate frame!! !